Skateboarding is more than a sport or method of transportation – it is an art form, a philosophy for life, a form of self-expression. Despite being one of Ethiopia's fastest growing trends, skateboarding is generally misunderstood. Dula ena Goma (“stick and wheel”) is an art installation focusing on skateboarding in Ethiopia. Using a mix of sculpture, paintings, video and live demonstrations, drop into the mindset of a skateboarder, see how they perceive the world and interact with their environment. 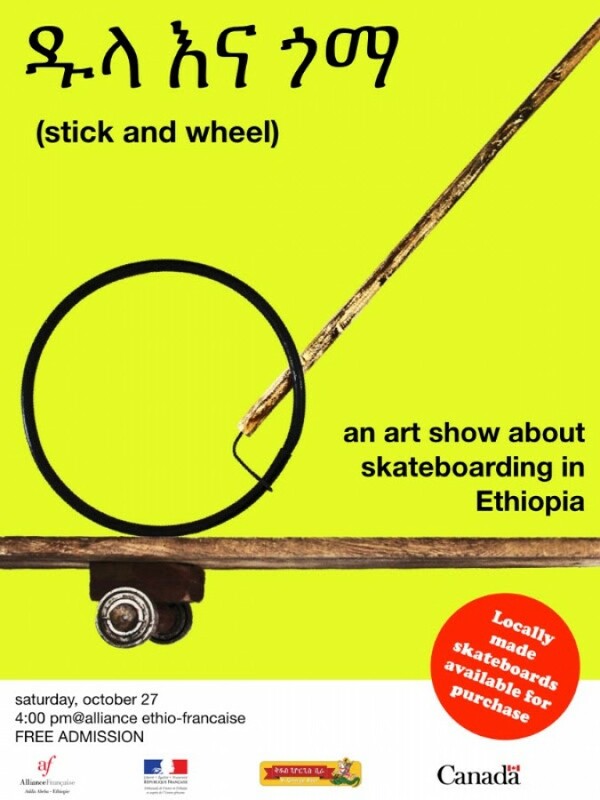 For potential skaters, visit Ethiopia’s first pop-up skateboard shop (October 27 and November 10 only) stocked with locally handcrafted skateboards available for purchase. For art lovers, some of Ethiopia’s and Canada’s most dynamic artists, including Kirbel Melke, Workneh Kassa, Dawit Muluneh, Woinshet Goshu, Crookedmouth Paintworks and Ato Tillik have left their unique mark on a number of display skateboards also available for purchase. Opening night will feature performances by the Ethiopian Skateboard Community (ESC), Ethios Hip-Hop Association (EHHA) and turntablists Tinnish and company. Free entrance - The exhibition closes on November 16th.